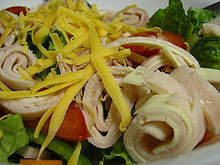 Chef salad (sometimes called chef's salad) is a type of salad. It usually includes a bed of leaf vegetables or lettuce, which can be served with hard boiled eggs, strips of meat (such as ham, roast beef, or turkey), cheese, cucumbers, croutons, and tomatoes. Chef salad is usually topped with Thousand Island dressing, but can be served with any type of dressing. Chef salad is thought to be invented by chef Victor Seydoux at the Hotel Buffalo in Buffalo, New York. Trying to save money, he started putting small slices of meat and cheese in salads for some of his customers. When his customers started to ask for their salad this way, it was added to the menu. This page was last changed on 22 August 2014, at 13:58.